Kimetto talked about his father's reaction when he went from farming to running: “My father said, train as well as you can and go for it, you can change your life." 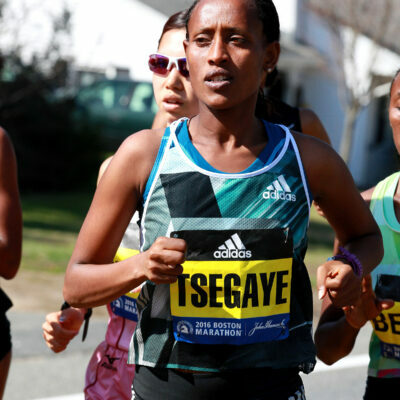 2:21 Ethiopian training partners Tirfi Tsegaye and Feyse Tadese along with Shalane Flanagan are all shooting for sub-2:20. Berlin Men's Preview: Will the World Record Go Down Again? The men's race in Berlin has produced a world record four times in the last seven years. With Dennis Kimetto (2:03:45 PB, #3 all-time), Emmanuel Mutai (2:03:52 PB, #4 all-time), Tsegaye Kebede (2x London champ, 2:04:38 PB) and world half marathon champ Geoffrey Kamworor all vying for the win, Wilson Kipsang's 2:03:23 WR from Berlin last year in in serious jeopardy. So too was Emmanuel Mutai's 30K record. His fastest was 2:46. His slowest 3:01. As I was thinking about the numbers behind this effort I got kinda scared, holy hell this was going to be a pisser of a long run! ... This was the most nervous I had been before a race in a long while. ""But like it has happened to thousands of other runners, in thousands of other marathons, at around 32km the pace began taking its toll. We backed off briefly in attempts to regroup. Just as that was happening a train of Ethiopian women came streaming by. For a lot of runners this would be pretty demoralizing- Shalane was already in her own little world of hurt, then these ladies just show up and float on by. This is when Shalane showed just why she is one of the best in the world. She kept completely calm and focused, she didn’t flinch. She waited, regrouped and then she dug the hell down! she began to fight back! (I have no idea where this strength came from, when this happens to me I usually start whimpering and drooling on myself.)" 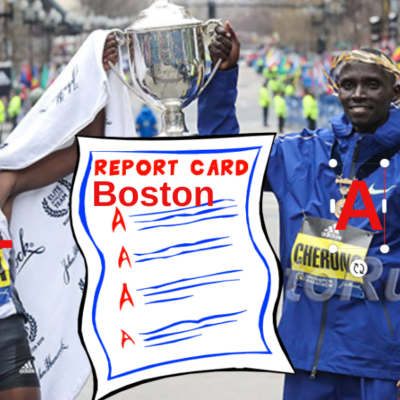 Did Mutai's underpronation cost him the race? The course, the competition and the weather obviously. Some interesting stuff though from Science of the Sport's Ross Tucker who says he doesn't expect to see a sub-2 hour marathon for at least 40-years "if at all". Includes a lot of interesting stats including comparisons to Wilson Kipsang's previous record, a look at Kimetto's negative splits (the first time since Haile G in 2008 and that was only by a second) and a shout out to the excellent Berlin pacers. After finishing 2nd for the 7th time at a WMM race Mutai should be pulling his hair out, but he's not. He must have one of the best losing attitutudes in sport and is already plotting what he can change in his training. He's even thinking of doing 42K in training so he can practice finishing the last 2K faster. 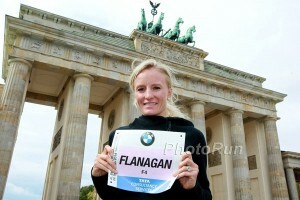 Vail talks a little about pacing Shalane Flanagan in Berlin. She split 25K in 1:22:36 to breat Janet Cherobon-Bawcom's previous mark by by exactly 2-minutes. Flanagan just missed Deena Kastor's 30K AR by 7-seconds. He talks about the ideal conditions for a marathon WR attempt, but financial incentives, course and weather conditions. He also asks why women's marathoning hasn't progressed like men's. Kipsang: “If I get a chance, I want to return to the same course in Berlin in 2015 and make an attempt to break the record. But it is a big stride ahead of the competitions. The bar has been raised and many athletes will find it harder to beat. But I believe there are about five or seven Kenyan runners who can try to break it and will be successful. ... I believe I can run faster. That record can be brought down to under two hours and two minutes." Wilson Kipsang: "1 year I was proud to carry the name of WRholder. Now I say congrats to my collegue Kimetto. 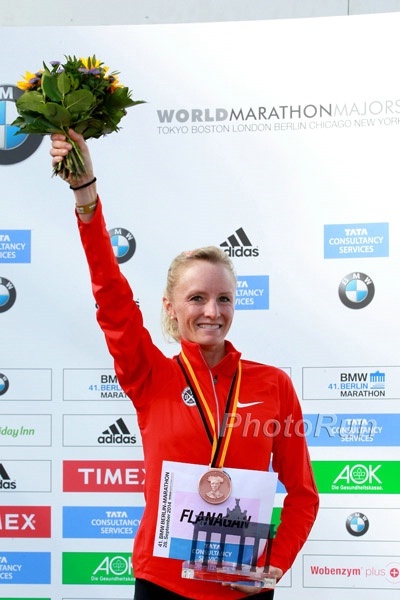 #focusonNY #onedaymyrecordagain"
How Do the Six Courses in the World Marathon Majors Differ? A look at the routes in Berlin, Chicago, New York, Tokyo, London, Boston. 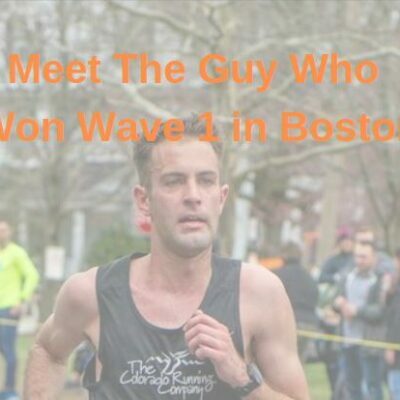 He talks about the trend to move to the marathoner at an earlier age and says, "Some athletes go the marathon too early, and then you cannot stay at it for a long time. If I was 18 or 20 when I moved to the marathon, I could not have run the marathons I've run in recent years." Last year's Tokyo and Chicago course record holder is running Berlin this weekend. 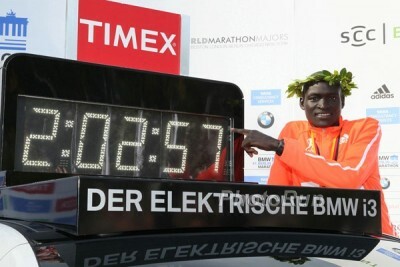 Dennis Kimetto - what are we Westerners still missing about Kenyan Marathoners? How long could you keep pace with Kimetto? 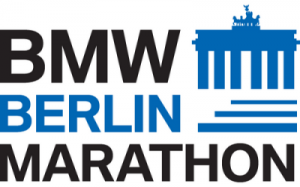 Great Q&A with WMM Leader Tsegaye Kebede who is running Berlin, " I get home from somewhere, I eat, I rest, then I train. There are no distractions. I have no vices."